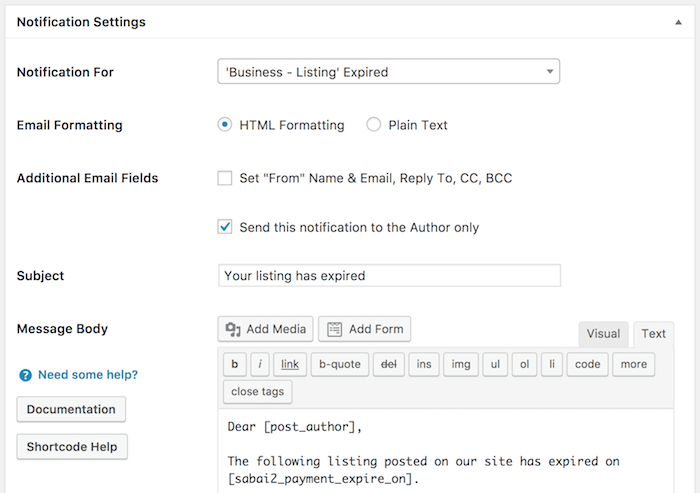 Directories Pro integrates with the Better Notifications for WordPress (hereinafter referred to as BNFW) plugin to send various e-mail notifications to users. Therefore in order to enable the notification feature in your directory, the BNFW plugin (https://wordpress.org/plugins/bnfw/) must first be installed and activated. Directory – Listing – Pending Review - Sent to administrators when a new listing that requires manual approval has been submitted. Directory – Review – Pending Review - Sent to administrators when a new review that requires manual approval has been submitted. Directory – Listing – Expiring - Sent to the author of a listing when the payment plan associated with the listing is about to expire (defaults to 7 days before expiration). Directory – Listing – Expired - Sent to the author of a listing when the payment plan associated with the listing has expired. Directory – Listing – Deactivated - Sent to the author of a listing when the listing has been deactivated (defaults to 30 days after expiration). Directory – Listing – Claim Pending Review - Sent to administrators when a new claim for a listing has been submitted. Directory – Listing – Claim Approved - Sent to the user submitted a claim for a listing when the claim has been approved. Directory – Listing – Claim Rejected - Sent to the user submitted a claim for a listing when the claim has been rejected. Note: If for some reason you do not see the above notifications created, try reloading all components from Directories -> System -> Tools. Notification for - Select the type of notification. You do not need to change this option unless you know what you are trying to do. Email Formatting - Whether or not to send the notification e-mail in HTML (recommended) or plain text. Set "From" Name & Email, Reply To, CC, BCC - Lets you configure additional e-mail headers. Send this notification to the Author only - Check this option to send the notification only to the author of the content item. If this was already checked, we recommend leaving it as-is. Do not send this Notification to the User that triggered it - Check this option if you do not want the notification e-mail to be sent for the actions that users performed for their own posts. Send To - Select user roles or individual users as recipients of the notification e-mail. Subject - Enter the subject of the notification e-mail. Notification shortcodes may be used in this field. Message Body - Enter the body part of the notification e-mail. Notification shortcodes may be used in this field. Click the Save button in the Save Notification metabox shown on the side. In addition to default shortcodes provided by the BNFW plugin, below are the list of shortcodes enabled by Directories Pro which you can use for directory listing and claim notifications. Displays a single field or all fields of the listing. field - Specify the machine readable name of a field defined for listings (e.g. post_title, field_email, business_photos), defaults to none. If none specified, then all fields that can be rendered in human readable format will be displayed. separator - Specify a string that will be used to separate values if the field has multiple values, defaults to a string specific to each field. Displays the URL of the listing index page in the backend. Displays the number of days remaining until the expiration date of the listing. Displays the expiration date of the listing. Displays the number of days listings are kept published after expiration until they are deactivated. Displays the URL of the dashboard page in the frontend. 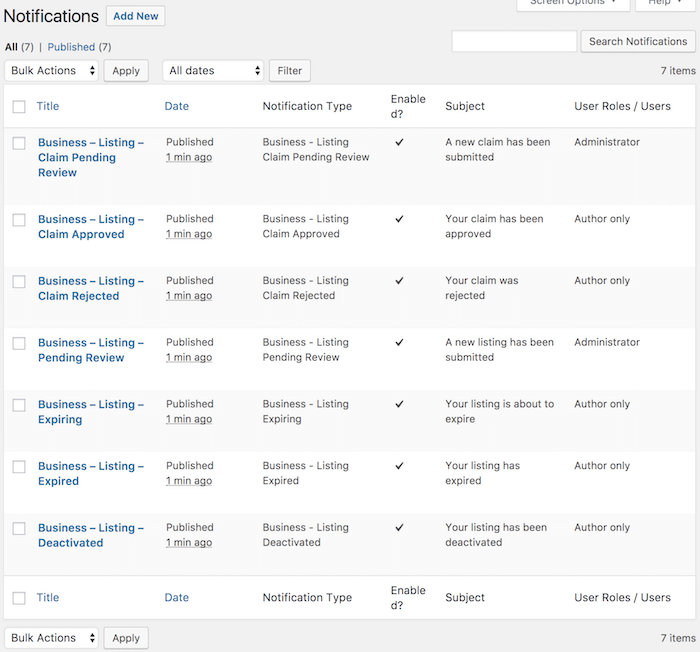 post_status - Specify the post status of listings to display on the dashboard page, can be either one of publish/pending/draft/expired/deactivated/expiring, defaults to none. The following shortcodes are available for claim/review notifications. Works exactly the same as [drts_entity] but displays content of a claim/review. Displays the URL of the claim index page in the backend.